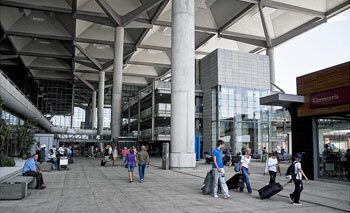 Travelers landing at Malaga airport usually arrive and collect their luggage on the ground floor of the airport building. From there they can leave easily the main building and catch a bus or taxi outside. To get to the suburban train station, passengers currently have to go to the old Terminal 2 and the corresponding parking area, from where crosses a bridge that leads to the train stop. By the end of 2010 is planned the opening of the new commuter station from Malaga airport. It will be located in the vicinity of the new arrivals terminal T3 and combines direct access to buses and a new suburban train station. The suburban train has regular connections with some of the major tourist resorts of Malaga, such as Torremolinos, Benalmadena and Fuengirola. To reach the towns of Marbella and Estepona, there is also a direct bus to Marbella bus station. For major comfort we recommend a private transfer from Malaga airport or Malaga airport car hire services. Find below the table for live arrivals at Malaga airport.